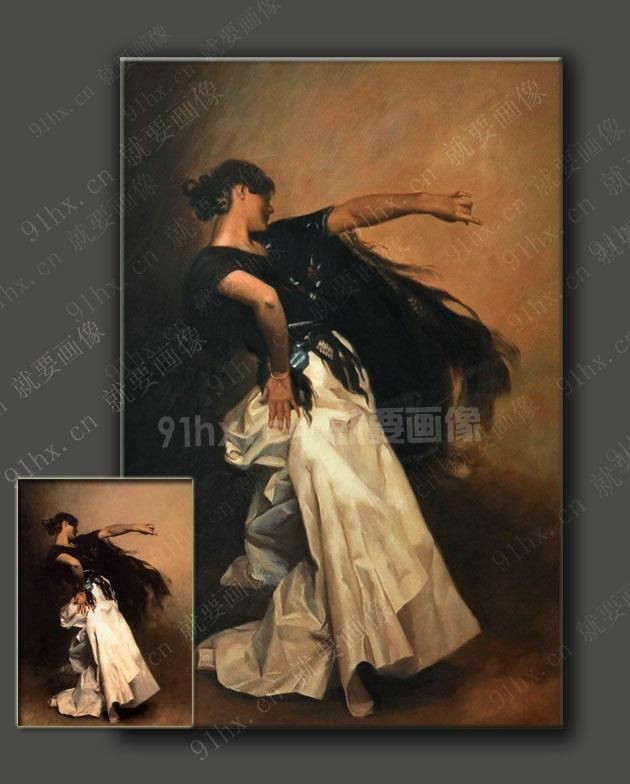 作品 西班牙舞者 The Spanish Dancer, Study for "El Jaleo,"
Almost 12 feet wide, El Jaleo is broadly painted in a nearly monochromatic palette, but for spots of red at the right and an orange at left, which is reminiscent of the lemons Édouard Manet inserted into several of his large paintings. At odds with the academic practice of carefully modulated tones, Sargent dramatized the contrast between rich blacks and the shining white skirt of the dancer, caught in the strong footlights and painted briskly so as to suggest movement. The lighting also creates long and eerie shadows on the rear wall that comprises nearly half the painting. The dancer, leaning asymmetrically, is placed to imply forward motion, from left to right across the canvas. El Jaleo is the most theatrical of Sargent's early major works. The lack of a barrier between the viewer and dancer helps create the illusion that we are present at the actual event; the manipulation of space and lighting communicates the energetic rhythms of the dance, its sound and movement.